In bits and pieces, the complete story of the compromising of Utah’s SunFirst Bank and the chain of events that led to the United States’ online poker “Black Friday” continues to emerge. A few more small pieces of the puzzle emerged recently when former SunFirst Bank compliance officer Cathy Scharf spoke of her SunFirst experiences at a Las Vegas symposium of the Association of Certified Anti-Money Laundering Specialists. Scharf was hailed as a heroic whistleblower at that event, in which she describes being threatened by SunFirst executives to turn a blind eye to the poker processing being channeled through SunFirst. In an Associated Press report on Scharf’s speech published by the Washington Post and other outlets, Scharf details being threatened by attorneys working on behalf of the bank within a week of being hired at SunFirst sometime late in 2010. According to Scharf the poker processing was being conducted openly, and she was told that the bank would fail without the poker business. The bank was making $400,000 a month from the transaction fees, which would have come from PokerStars and Full Tilt business. A far more complete version of Scharf’s whistleblowing saga has been published recently by WorldCompliance.com, a for-profit entity that provides compliance services and personnel to the banking and finance sectors. World Complaince’s 11-page recap of Scharf’s year at SunFirst names at least a couple of Black Friday names, which are noticeably absent from the latest AP report. Still, the WorldCompliance writeup occasionally slips into gratuitous hyperbole, such as its tossing in of mentions of the Gambino and Genovese crime families of New York and PartyPoker and its founder, Anurag Dikshit, none of which had any known connection to the SunFirst operation. There are some worthy inclusions, despite the fluff. The 11-page recap pins a lot of the blame at SunFirst on payment processors Chad Elie and Jeremy Johnson, as well as SunFirst executives such as SunFirst Vice Chairman and part owner John Campos, whose bank had seen its fortunes sag following the mid-2000’s bursting of the housing bubble. Campos was one of the eleven individual “Black Friday” co-defendants, along with Elie (but not Jeremy Johnson), and the only SunFirst exec to be indicted for his role in the scheme. Campos might have skated along with the SunFirst execs who were in on the scheme to some extent — and who may have been part of the the threats made to Scharf — except that Campos clearly accepted a $20,000 “bonus” payment from Johnson tied directly to the poker processing. The SunFirst tale remains interesting and partially obscured, though this latest chapter pulls throws back the curtains just a little bit more. Campos was the only one named in the WorldCompliance story, and though not named in the AP stories, he’s the banker who was sentenced to three months in prison in 2012 for his role in the affair. However, at least three other SunFirst execs can be shown to be involved, based on memos released by Chad Elie himself last year. Those three were SunFirst CAO and Vice President Dan Strobell, Business Development Manager Mont Humphries, and SunFirst President John W. Allen. Law enforcement conducted a long term investigation. It was initiated based on wiretaps conducted by the Rockland County, New York Sheriff’s Office. The case was referred to the Federal Bureau of Investigation (FBI) based on organized crime implications. The FBI was assisted by Homeland Security Investigations (HSI) and the New York High Intensity Financial Crimes Area (HIFCA) task force. The investigation started as an organized crime case that evolved into an investigation of money going into illegal internet gambling. The government dedicated considerable time and resources to this investigation. The investigation involved three waves of indictments, the first focused on organized crime; the second on payment processors; and the third on poker companies. SunFirst Bank was one of about 12 banks involved in the payment process. sources noted that they received outstanding cooperation from the U.S. banks they dealt with. That is somewhat different than the currently accepted version of the story. It’s been known for some time that the actual ordered shutdown of the SunFirst processing was done in November of 2011, implemented through a Federal Deposit Insurance Corporation (FDIC) edict and agreement with SunFirst that the bank was in violation of regulations regarding third-party payment processing (TPPP) which in this case meant the shielding of the true identities of Stars’ and Full Tilt involvement. It was this technical form of bank fraud that Elie admitted to and accepted his plea deal and five-month federal sentence in the case. What now becomes clear is the sequence of events: Scharf likely took her complaint to the FDIC, and the names entered in connection with SunFirst’s activities probably triggered red flags in other agencies’ databases. Those surely included Jeremy Johnson’s iWorks telemarketing-fraud investigation (FTC), and the DOJ’s ongoing efforts, post-UIGEA, to dig up some hard dirt on Full Tilt and PokerStars. Scharf’s story dropped right into their laps, and a multi-jurisdictional investigation was underway. There are still numerous funny twists yet to be explained fully. The above passage mentions that about 12 banks were being utilized in various forms for the processing. Offhand, I can think of seven or eight, though some of them were likely used only as conduits. Elie himself opened two accounts at Chicgo-area banks that are likely among that count. The link between the online poker companies and SunFirst Bank began with Chad Elie. Chad was a third party processor, who processed transactions for PokerStars, Full Tilt Poker and Absolute Poker. He needed a bank he could work with as a transparent processor. Enter Jeremy Johnson. Jeremy was an alleged telemarketing fraudster, who is still under investigation by the Federal Trade Commission (FTC). He met Chad Elie at an online marketing symposium in Las Vegas. Chad and Jeremy formed a processing company together, Elite Debit. Jeremy had a bank, SunFirst Bank. Employees of the bank used to joke that SunFirst Bank was “the bank of Jeremy Johnson”. SunFirst Bank was experiencing financial difficulties and they enlisted Johnson to be an investor and part owner. Jeremy introduced Chad Elie to John Campos, Vice Chairman and part owner of SunFirst Bank. Elie promised to invest $10 million in the bank and to bring in millions of dollars through processing transactions for the online poker companies. Campos agreed[,] with “trepidations” about the gambling processing. It now seems clear that the open acknowledgment about the bank’s activities by its employees included these sidelong references to Johnson, and that Scharf was the one who brought the integral involvement on non-SunFirst-exec Johnson to the FDIC’s attention. That “Bank of Jeremy Johnson” quip worked its way into related court documents, and Johnson had also been ID’d as running a good chunk of his fraudulent iWorks business through SunFirst. By 2009 that was on the wane, however, and SunFirst and Johnson both needed more money. With the support of colleagues, she hired a lawyer, started a diary of her travails, and began working with federal authorities. It was a scary time. 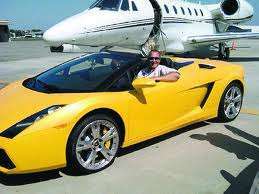 During one weekend trip back to Las Vegas, Scharf saw a yellow Lamborghini shoot by her. The driver was one of the honchos at the bank. “All I could do was shut my eyes,” she said. The owner of that yellow Lamborghini? None other than Jeremy Johnson. That’s the car at right, occupied by future Utah attorney general Mark Shurtleff, parked in front of Johnson’s private jet. The tales of Johnson and his cohorts’ frequent and lavish junkets to Las Vegas, where they squandered millions, are perhaps only equal to the tales of Johnson at the high-stakes tables on FTP, where he squandered a couple of million more. The depth of the evidence being amassed against Johnson and SunFirst and the totality of online poker makes it inevitable that Black Friday was going to occur. That Cathy Scharf turned out to be one of the unsung linchpins is a neat tale, but if it wasn’t her, the entire rickety structure was going to collapse soon anyway. It also transforms into high comedy the antics of John Pappas and the Poker Players Alliance traveling to Utah in late 2010 on behalf of SunFirst (if indirectly), to lobby the politically connected Shurtleff to work to make the poker processing even more legit within Utah’s boundaries. FlushDraw recounted that head-spinning saga in a five-parter starting here, which includes the tale of Johnson secretly recording his conversation with Shurtleff in a Utah donut shop, and Pappas flying to Utah to preach the “federalist” nature of poker-processing to Utah officials, a state so conservative that no gambling of any form is allowed within its borders. The absurdity of it all…. Pappas later admitted to having roughly five phone conversations with Pappas and was likely introduced electronically to Pappas via prominent gaming attorney A. Jeff Ifrah, who has since then become involved in an ongoing fraud/malpractice scrap with convicted Black Friday defendant Elie. Even acknowledging that Pappas and the PPA were acting at the behest of their major corporate benefactors (Full Tilt and PokerStars) in doing so, , it’s absolutely asinine — and incredibly comic — that the PPA waded into the Utah tarpit without managing to grasp a better sense of the deep picture that was already beginning to collapse around the SunFirst and Jeremy Johnson operation. There’s also little doubt, two years and change removed from Black Friday, that Full Tilt’s and PokerStars insistence on finding banking solutions within the US banking system sealed their own fate. Rather than rely on international solutions that would have introduced a necessary but technically legal lag time into the processing cycle, the sites opted to pursue instant gratification, willfully committed fraud in doing so, and gift-wrapped a ready-made case to the DOJ in the process. Somewhere along the line that translated into bank officers being threatened to be quiet. And that’s how Black Friday happened.